जिन्होंने अपनी जिंदगी में बड़ी कामयाबियाँ हासिल की हैं, जिन्होंने इस संसार को और ज्यादा सुन्दर, और ज्यादा बेहतर बनाने में अपना योगदान दिया है, वे लोग हैं, जिन्होंने अपने जीवन में समय का सार्थक उपयोग किया है। जीवन में समय की क्या कीमत है? और कैसे इसका बेहतर तरीके से उपयोग किया जाय? 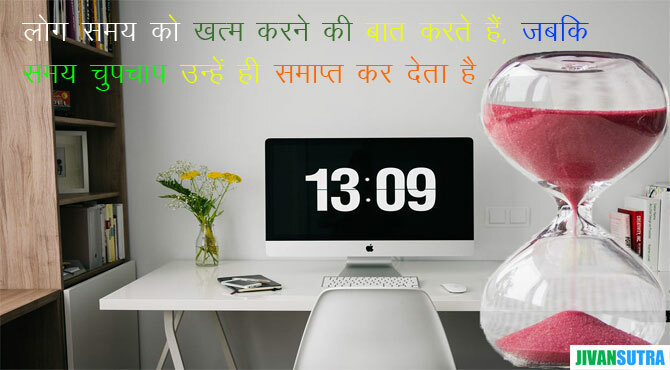 इन बातों को शायद हम इन प्रेरक वचनों से ज्यादा बेहतर समझ पांए! Learn to enjoy every minute of your life. Be happy now. Do not wait for something outside of yourself to make you happy in the future. Think how really precious is the time you have to spend, whether it is at work or with your family. Every minute should be enjoyed and savored. The chief beauty of time is that you cannot waste it in advance. The next year, the next day, the next hour are lying ready for you, as perfect, as unspoiled, as if you had never wasted a single moment in all your life. You can turn over a new leaf every hour if you choose. Our last 5 minutes on earth are running out. We can spend those minutes in meanness or we can spend them consciously embracing every glowing soul who wanders without reach. Do not let the future be that time when you wish you would have done what you are not doing now. One who wants to enjoy a good future should never waste a moment of his present. You better live your best and act your best and think your best today… For today is the sure preparation for tomorrow and all the other tomorrows that follow. Lost wealth may be regained by diligent work, lost knowledge by study, lost health by temperance or medicine, but lost time is gone forever. A person who dares to waste one hour of time has not discovered the value of life. Waste your money and you are only out of money, but waste your time and you have lost a part of your life. Time is life. Therefore, Waste your time and waste your life, or master your time and master your life. Many of us spend half our time wishing for things we could have if we did not spend half our time wishing. The future is an endless world of opportunities and possibilities. Take care of the present and the future will take care of itself. Time and the world never standstill as Change is the law of life. And the people who look only to the past or the present are certain to miss the future. In times of adversity remember to keep an even mind. My favorite things in life do not cost any money. It is really clear that the most precious resource we all have is time. Patience and time do more than strength and passion. Yesterday is a canceled cheque, Forget it. Tommorrow is a promissory note, Don’t count on it. Today is a ready cash, Use it. In hard times our focus is much of ourselves. This is the time when we intrview ourselves. People talk of killing time, while time quietly kills them. If you love life, do not waste time. For time is what life is made up of. On the sand of time, you can’t make the footprints by sitting.